In the spring we offer the service of planting flowers for you. Choose from our selection of spring plantings and we will take care of the rest. Also available in the spring is our watering service from Memorial Day through Labor Day. Call our office for information. 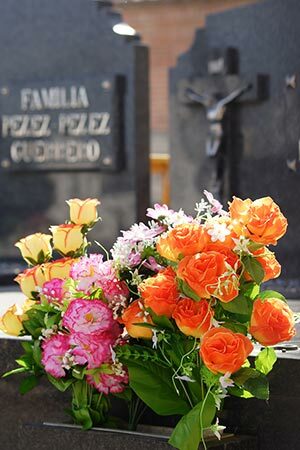 For the people with loved ones at our cemetery we offer the service of handling your grave blanket needs. Simply choose from our selection of fall decorations and we will install and remove it for you. Please stop into our office to purchase removal tags for the disposal of winter graveblankets and decorations. Tags are $5.00 and need to be fastened to items for removal in March. If you would like to receive an e-mail about spring or fall decoration services as they become available, please contact us regarding so on this website or call 586-463-0851. Winter decorations are removed March 15th. each year weather permitting. The Cemetery is open from sun up to sun down 7 days per week, 365 days per year. The office is open Monday – Friday 9am to 4:30pm, and Saturday 9am to 1pm.